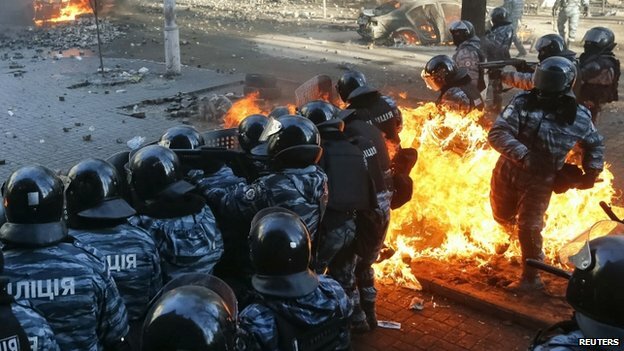 The new attempt to uproot the protest stronghold came as President Yanukovych blamed opposition leaders for the worst violence in months of unrest. After failed overnight talks, he urged them to distance themselves from radical forces. 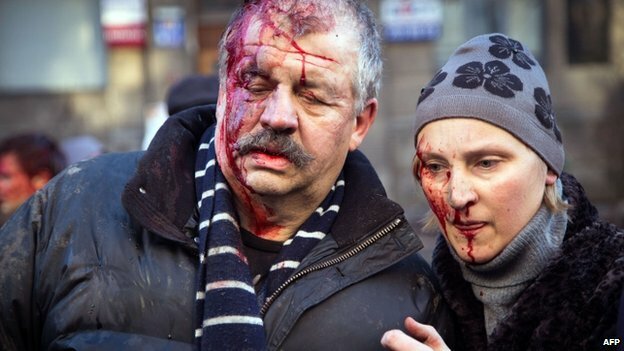 Activists say the violence has been stoked by the authorities. Police launched their latest assault on Independence Square, also known as the Maidan, shortly after 04:00 local time (02:00 GMT). Several tents were set ablaze, and water cannon was later used. A BBC correspondent said police had taken control of a corner of the square for the first time since December. 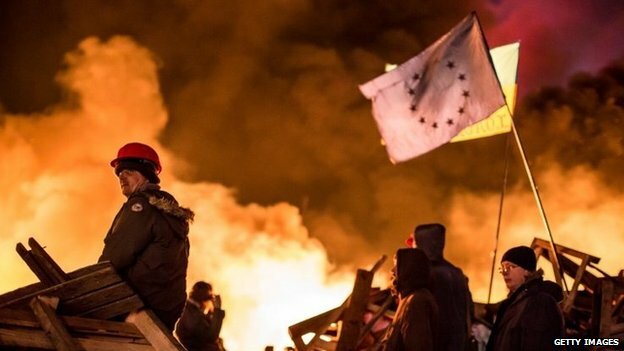 The protests began in late November, when President Viktor Yanukovych rejected a landmark association and trade deal with the EU in favour of closer ties with Russia. Tensions had begun to subside as recently as Monday, as protesters ended their occupation of government buildings in return for an amnesty against prosecution. But violence erupted outside parliament on Tuesday morning as government supporters blocked opposition attempts to scale back the president's constitutional powers. The clashes spread to surrounding streets and police launched a first attack on Independence Square on Tuesday evening. In a statement, the health ministry said on Wednesday the number of dead on both sides had risen to 25. Nine of those killed were police, the interior ministry says. A journalist has also died. Explosions are taking place, fireworks are being thrown and large fires can been seen. Thousands of policemen have been surrounding the Maidan since Tuesday, although reports saying that many anti-government activists are heading to join the camp. In a statement on Wednesday morning, President Yanukovych said: "The opposition leaders have disregarded the principle of democracy according to which one obtains power not on the streets or maidans - but through elections." "They have crossed the line by calling for people to take up arms," he said, warning that those responsible for violence would face the law. But the president added that there was a "better and more effective way" to solve the crisis - through dialogue and compromise. "It is not too late to stop the conflict," he said. Security forces had given the protesters a deadline of 18:00 on Tuesday (16:00 GMT) to leave the square, the scene of a mostly peaceful protest camp since November. "This is an island of freedom and we will defend it," said Vitaly Klitschko, the leader of the Udar (Punch) party. Arseniy Yatsenyuk, who heads the Fatherland party, appealed to President Yanukovych to "stop the bloodshed and call a truce". Earlier on Tuesday, police blocked protesters from marching on parliament, where MPs had been due to debate proposed changes to the constitution. The debate did not take place. Mr Yatsenyuk said President Yanukovych was blocking the reforms and that his allies "show no desire whatsoever to end the political crisis". But MPs who support the president said the proposals had not been thoroughly discussed, and that more time was needed. Some protesters outside parliament ripped up cobblestones to throw at police. Police fired stun and smoke grenades as well as rubber bullets. Correspondents say it was unclear what sparked the latest violence, with each side blaming the other.